Sacco will be present at the prestigious 4-day Angouleme International Comics Festival, which kicks off January 27 where Footnotes in Gaza is also in the official competition. [he won a prize there too...]"
- December 2009 - Footnotes in Gaza comes out in the U.S. 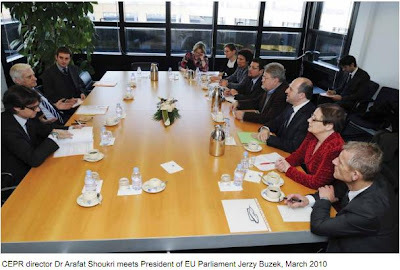 The Chairman of the European Parliament Jerzy Buzek (Poland)met in March 2010 Mr Arafat Shoukri, Executive director of the Palestinian Return Centre (PRC) et chairman of the European campaign to End the Siege on Gaza, an umbrella organisation for 30 European NGOs. Arafat Shoukri was also the guest of Javier Solana (Spain)! 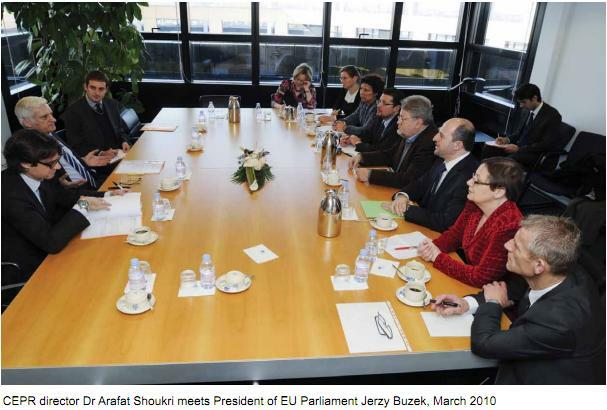 We deeply regret that the head of the European Parliament finds that Arafat Madi Shoukri is a reliable interlocutor, considering that he is involved in organizations with links with Hamas and Hezbollah. We further regret that none of the 736 European law-makers voiced disapproval about such a meeting. Sadly, this is just becoming the norm. It turns out that Belgian Euro-parliamentarian Véronique De Keyser has met with him recently. One can imagine the uproar that such an invitation would cause were he to be invited by the President of the U.S. Senate... Not in Europe. The Congress reaffirms the need to popularize the culture of resistance and its practice as the option of resistance is the best and shortest way to realize the return of the refugees to their homes. It calls for the safeguarding of this option and its fortification on the national, patriotic, Islamic and international fronts. They reaffirm their support for the national, patriotic and liberation stand of Syria and the steadfastness of its people under the leadership of Dr Bashar Al Asad in the face of all forms harassment, threats and aggression the last of which was the abhorrent American attack on Syrian territory. They regard support for the Iraqi resistance and safeguarding of the unity and Arab identity of Iraq an important step toward the restoration of the Palestinian people of their land and rights. The participants in the Arab International Congress for the right of return convinced of the longstanding and current danger of the Zionist role in the plots to dismember Sudan and undermine its national unity, Arab, African and Islamic identity and halt its role as a bridge between the Arab ummah and its strategic and civilizational depth in Africa declare their firm support for the people of Sudan in their struggle against all forms of colonial intervention, dubious internationalization and provocative initiatives. This was hardly the first time the PRC associated itself so closely with terrorists. In 2007, it hoped to invite Hamas leader Ismail Haniyeh to a conference in Rotterdam. The Dutch authorities refused to issue a visa to Haniyeh. So another Hamas minister was dispatched. He managed to get a visa but was stopped at the airport in Brussels and turned back when the Dutch realised they had made a mistake and alerted the Belgians. For the PRC’s Al Zeer, refusing entry to a member of a proscribed terrorist group was nothing less than a “humiliation of the Palestinian people”. In 2006, Sweden was more Hamas-friendly than the Netherlands: it allowed another Hamas minister to attend a PRC conference. In Europe nowadays one finds communists, greens/ecologists, far-rightists and in France there is even an anti-Zionist party ... nothing really changes!
" Left Party’s politicians and supporters get so riled up about Israel but remain awfully silent about countries where real human rights abuses are unfolding: Syria, Yemen, Saudi Arabia, Iran, Libya, and the list continues." "In 2003, Christian Democratic Union MP Martin Hohmann called Jews a “race of perpetrators” and argued that their involvement in the Russian Revolution of 1917 exculpates German atrocities during the Holocaust. Following this perverse line of reasoning, both Germans and Jews committed crimes against humanity." Germany’s Left Party passed a resolution earlier this month barring the party’s parliamentary representatives and employees from participating in the upcoming flotilla to break Israel’s naval blockade of the Gaza Strip, which remains under the control of the terrorist organization Hamas. Despite the resolution - which also calls for an end to boycotts of Israeli products and demands for the dissolution of the Jewish state - the Left Party remains in denial about anti-Semitism in its ranks. In their groundbreaking investigation, Political scientists Samuel Salzborn from the University of Giessen and Sebastian Voigt from the University of Leipzig sharply criticized the entrenched left-wing anti-Israel attitudes within the Left Party. Last year, Left Party city councilwoman Erika Zemaitis voted against funds to build a new Synagogue in the city of Herford, to replace one the Nazis had torched in 1938. The party’s foreign policy spokesman, MP Wolfgang Gehrcke, has participated in demonstrations in support of the terrorist groups Hamas and Hezbollah. In May 2010, two Left Party parliamentarians, Inge Höger and Annette Groth, joined a group of radical Turkish Islamists aboard the Mavi Marmara vessel, to violate Israel’s maritime blockade of Gaza. When they returned, along with former party foreign policy spokesman and MP Norman Paech, who came along for the ride, Left Party leaders gave them a hero’s welcome in Berlin. How did anti-Semitism return to the very nations that pledged never to repeat it? "How, then, did anti-Semitism return to the very nations that pledged never to repeat it? The cynical answer is that it never died, it merely went underground. There is a shred of truth to this, but very small. As a line of reasoning, it is deeply misleading. For the new anti-Semitism is only secondarily aimed at Jews as individuals. Its real target is Jews as a nation – in Israel." Strange but typical reasoning. European Jews believe that Europeans like them. Antisemitism is just a huge misunderstanding and all is needed is more explaining and yet more explaining. Indeed we need more explaining and all will be sweet and light. For the Jews of Europe, these are the best of times and the worst of times. Take British Jewry as an example. In the past 20 years we have built more Jewish day schools than ever before in our 355-year history. Culturally, a community deemed moribund a generation ago boasts a cultural center, a community center in the making, Jewish Book Weeks, arts, music and film festivals, and an adult-education event – Limmud – that has inspired offshoots in 50 other centers throughout the Jewish world. Jews have achieved prominence in every field. Both parliamentary speakers, in the Commons and the Lords, are Jewish. We have had, in recent years, two Jewish lord chief justices, Jewish heads of Oxford and Cambridge, a Jewish editor of The Times and Jewish leaders of both the Conservative and Labour parties. Not only are Jews respected, but so is Judaism. The Jewish moral voice has become a significant part of the national conversation. THESE ARE astonishing achievements. But they are clouded by the disturbing phenomenon of a new anti-Semitism spreading like a virus across Europe. This cries out for explanation. After all, after the Holocaust, if there was one thing on which people of goodwill throughout the world agreed, it was: Never again. The entire post-war culture of the West – of the world – was tilted in that direction. Out of the determination that there should never be another Holocaust came the United Nations’ Declaration of Human Rights, the concept of a “crime against humanity,” the idea that racism is a vice, the movement for interfaith dialogue, and the historic shift in Christianity known as Vatican II, Nostra Aetate. The spokesman of the French Ministry of Foreign Affairs, Bernard Valero, expressed the deep concern of his country in view of the expansion of the Jewish presence in Jerusalem. The French politician was angered by Israel Defence Minister Ehud Barak's statement on French TV that it is not possible to stop building in Jewish settlements (the French call them "colonies"). Mr. Valero said that his country's position remains unchanged. Jewish presence in East Jerusalem and the "West Bank" is illegal. Popular French comic actor Elie Semoun told on the radio that many French Jews want to leave France for Israel or the United States. Elie Semoun said that there is a sort of massive paranoia ("grosse parano") and fear. He indicated that as far as he is concerned he feels totally at ease and secure in France and thinks that Jews should stop being paranoid and wanting to leave. Semoun has been to New York and was impressed by Jewish life there: Jewish shops, Jewish neighborhoods, Jews going about their business with their yarmulkes, etc. That's the environment French Jews aspire to leave in. Hence the paranoia. "I hear this a lot among the Jewish community." Antwerp-based Jewish magazine Joods Actueel reports that a free Flemish magazine available in Belgium and the Netherlands in the areas of Knokke-Heist, Sluis, Cadzand, Aardenburg, Oostburg, Brugge has published an article complaining bitterly about "kikes" in Belgium (in particular their behavior in the posh seaside resort Knokke) and about their cruelty against Palestinians in Israel. Below are excerpts translated from the Dutch. "The Gaza Strip, the West Bank and the Golan Heights are only small blemishes on the handkerchief of international politics [...] There are settlements, walls are built and the world watches passively. From time to time a finger is pointed in reprimand and that's it. Some [Palestinian] children will throw stones while a pre-war bomb is launched towards Zion, but the gray squirrels [reference to the author who signs "Red Squirrel"] with their yarmulkes continue to grab land at the expense of the Palestinians. Aren't the Jews the chosen people? Didn't the Aryans [reference to the Nazis] make the same claim? Kikes ["smouzen", derogatory term for Jews and also means cheater, dog, etc.] and the Nazis, all in the same bag. They are Übermenschen, what nonsense." "Have you ever tried to take a stroll in May on the Knokke promenade? It seems that the whole diaspora troops have flocked together. Men with their curls, their funny aprons and black hats. The women wear wigs and long stockings. The whole world belongs to them. Do they make way for you? No way. We are the chosen people, dear sir. And then they wonder why we can't stand them." Joods Actueel has contacted the Knokke police spokesperson. 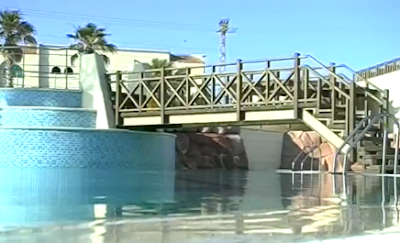 Inspector Vaneenoghe formally declared that Jews cause no problems and that there are no police records or complaints about the conduct of the Jews who stay at the resort. The mayor of Knokke, Count Leopold Lippens, said he was shocked by the racial connotations of the article. "It's absurd. Everyone is welcome here. We are all Belgians." He ordered the magazine to be removed from all public places (shops, libraries etc) . Guy Poelvoorde, the editor in chief of the De Zwinkrant, was also contacted. At first, he welcomed the request of Joods Actueel to publish a right of reply. But when asked to confirm his consent by email, he slammed the phone. Two days later the article is still available on line. The editor remains unrepentant and claims that it was just "satire" and that there is no ill feeling towards Jews. The head of a Brussels bridge club aged 60 violently slapped in the face a Holocaust survivor aged 85 who fought against the Nazis and who helped save a number of young girls from the Gestapo. Nothing - absolutely nothing - can justify that a much younger man assaults an elderly man. 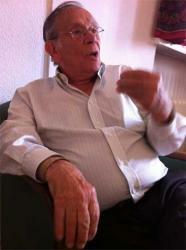 Reginald Delacroix is unrepentant and claims that Mr. Bernard Fenerberg [photo] was the aggressor... Sadly, a number of people witnessed the assault and did not show any sympathy with the victim - some of them were Jews. The blog that reports the incident observes that many within the Jewish community show a regrettable lack of sympathy to the suffering of others. Does Germany care really about Gilad Shalit? 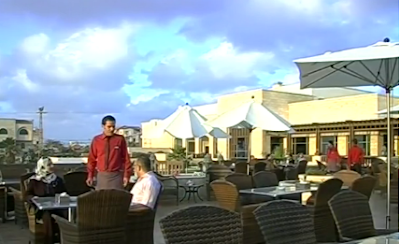 A 5-star hotel was inaugurated last week in the Gaza strip, the "huge open air prison, which suffers from a chronic lack of basics". 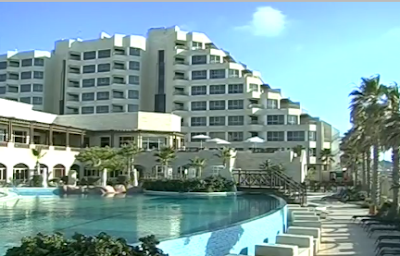 The luxury hotel boasts 200 rooms, 68 staff members (they hope to double the figure within a year), and a huge swimming pool (reserved for male patrons), filled with water which in such dire shortage in the Gaza "concentration camp". Oddly, the Spanish TV chain does not diclose the name of the owner or the name of the hotel. But it looks like the Mövenpick... The hotel will be managed by a Spanish hotel group. Not surprisingly in a country where Jews make up less than 0.03 percent of the population, Jewish issues do not feature prominently in local politics. “As an MP during these 32 years I have rarely been confronted with issues related with Jews and Jewishness but of course the situation in the Middle East is always present,” he said. Ben Zysowicz, Finland's first Jewish lawmaker, tells of assault and anti-Semitic insults. In a country like Finland, where the Jewish community of 1,500 people makes up a tiny percentage of a population of 5.4 million, anti-Semitic incidents are rare, which is why the recent attack on the Jewish speaker of the parliament was so unusual. Ben Zyscowicz, the country’s first Jewish lawmaker, was walking home the Wednesday before last after a round of late-night political negotiations when he was suddenly assaulted by a stranger. “I was walking with a friend in the city very late in the evening when a man who was clearly under the influence of alcohol came toward me,” he told The Jerusalem Post by phone on Friday. “He tried to hit me and he only managed to touch me on one shoulder. He also shouted insults to me based on the fact that I’m a Jew. The 57-year-old member of the National Coalition Party was not hurt and said he did not plan to file a complaint. He said hate crimes against Jews in his country were uncommon. In his long career as a politician he had received the occasional anti- Semitic letter. He had been physically attacked twice before, but not because he was a Jew. “This is very, very rare that this happens,” he said. Pilar Rahola is known for her denunciations of Islamic and Arab dictatorships, as well as for defending the rights of women in Islamic societies. She recently published a book titled "The Islamic republic of Spain". IN the past she got death threats and was designated an 'enemy of Islam' by Spanish Muslim organizations for her positions favoring Israel and opposing Palestinian terrorist organizations.